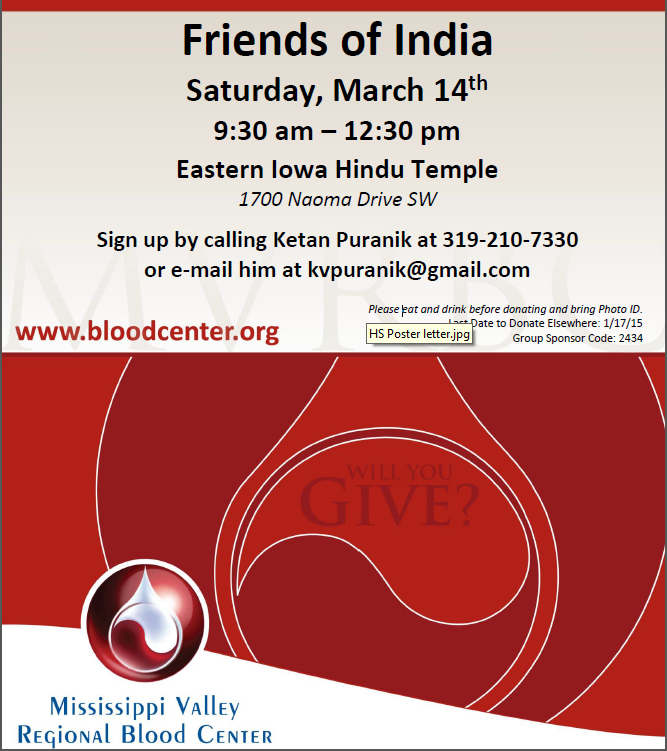 Friends of India Cedar Rapids - BLOOD DRIVE on Saturday, March 14th from 9:30 AM – 12:30 PM at Eastern Iowa Hindu Temple. Since 2012, FOICR has contributed 60 units of blood to help over 175 patients in local hospitals. Thank you for your continued support and please sign up to donate this spring! Last date to donate elsewhere: 01/17/2015. That means iif you have donated blood on or after Jan 17, 2015 then you will not be able to donate. PLEASE BRING A PHOTO ID AND EAT BEFORE DONATING. If you have been to India after March 13, 2014 then you will NOT be able to donate. Please contact volunteerchair@foicr.org if you have any questions regarding eligibility.